Jan Fabel, of the Hanburg Murder Squad, struggles to interpret the twisted imagery of a dark and brutal mind. Four days later, a man and a woman are found deep in woodland, their throats slashed deep and wide, the names ‘Hansel’ and ‘Gretel’, in the same tiny, obsessively neat writing, rolled tight and pressed into their hands. My take: Now this is what I absolutely hate about Dan Brown. Like really, why is the man so bloody good at telling a story? He makes everyone look so….not-up to-par! Okay, this is probably just what I feel but seriously, whenever I read a thriller or a suspense novel etc, I end up comparing it to what Dan Brown offers. And that is just so unfair because they all have their own style and they are different and good in their own places but man, Dan Brown is the king of thrillers/books-you-can’t-bloody-put-down. Alright. Phew. Now that I have that out of my system I can focus on the review at hand. I don’t usually compare different authors and books unless I’m absolutely compelled to or when I’m reviewing a series. This book is the second one in the thriller series by Craig Russell which are all based on a central character Jan Fabel and follow him solving crimes. Although the characters remain the same you can easily pick any book of the series (currently, I think there are 3 already published) and follow the story as the plot is different and individual in all. 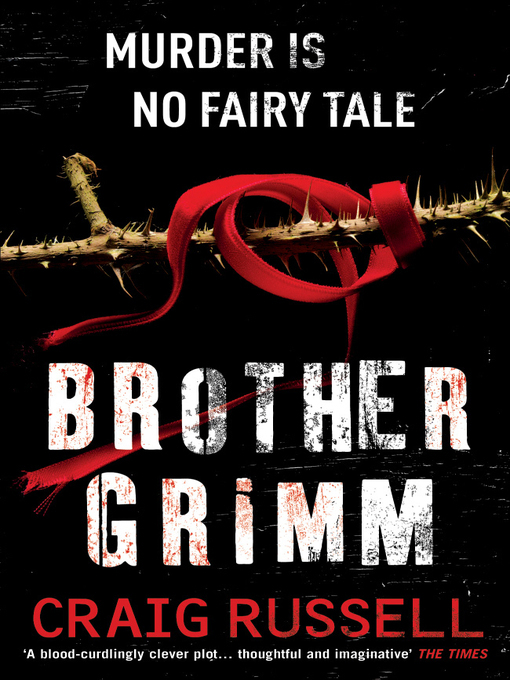 The book “Brother Grimm” is 448 pages long, has the tagline Murder Is No Fairy Tale and has A LOT of words in German but if you, like me, have no clue about the German language then you can skip through them the way I did and everything still makes sense. The words usually represent police ranks and places. Take a serial killer and add the history and evolution of folk literature. Weird? Not so. That is what the book is about and I tell you, the combination paid off. The story is about a serial killer who is so inspired by the German folk stories that he starts carrying out murders and props up the bodies as if they were characters of the stories come to life. He believes that “we are all variations on the same theme”, the theme being the story. Meaning, that we are all characters of one story or the other, only slightly different from the original characters. He is helped in this belief by an author who has recently published a book which shows how explicit the Brother Grimm fairy tales were when they were first recorded and how we have sugar-coated them to please us. This character provides a creative take on fairy tales and I was particularly entertained to read the parts where he appeared to help explain the killer’s psyche. The plot was engaging, the suspects kept changing and the climax was horrific as well as a surprise . Overall, I found it a nice read, albeit not a bloodcurdling thriller but one to keep you turning the pages. The pace is a little slow at times, but otherwise moderate. You are a Craig Russell fan. You are particularly into the thriller genre. You like intrigue and a complex plot. You would like a different take on folk literature. You’re not one for thrillers and murder stories. You’re not one to read books that run on the thicker side. You’re not really interested in the history of folk literature.